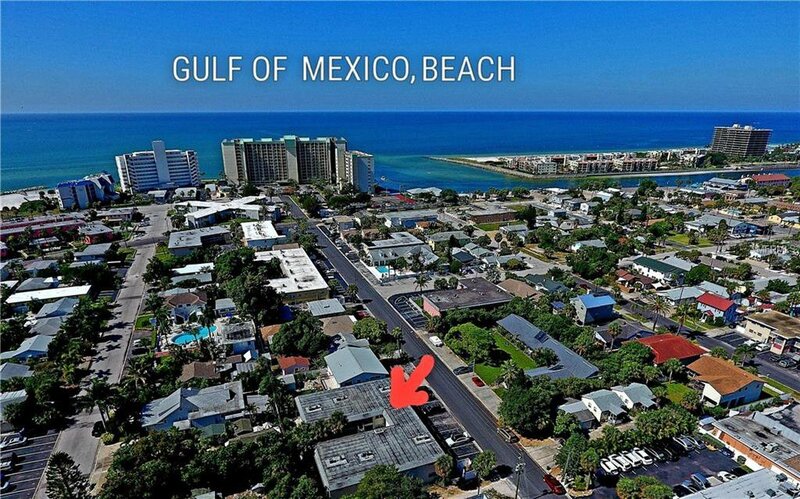 Amazing opportunity to own a Piece of Paradise on St. Pete Beach! First floor, 1 Bed, 1 Bath spacious condo with open floorplan is just a short walk to the finest powdery sand beach. INCREDIBLY LOW MONTHLY FEES! -only $150/month, you will not find lower! Many updates include tile flooring throughout and Bedroom carpet installed less than 1 year ago, Open Kitchen, updated countertops, fixtures & lighting. A/C system replaced about five years ago. All new window blinds. Bathroom updated with new tile, vanity, fixtures and lighting. New lighting and ceiling fans throughout. Whole unit recently painted. Laundry room conveniently located outside near the unit. Assigned parking spot. The building has been recently painted. Small complex with only 12 units & allows for privacy when relaxing in the cute tropical style courtyard. Amazing location, short walking distance to multiple Beach Restaurants and bars, live music, shopping and Corey Ave Sunday Markets. Short drive to downtown St. Petersburg, museums, malls & movie theaters. Listing courtesy of COLDWELL BANKER RESIDENTIAL. Selling Office: RE/MAX METRO.